The start of the post-2015 development era presents a prime opportunity to examine current financing for education and identify options for improving the current global education architecture. 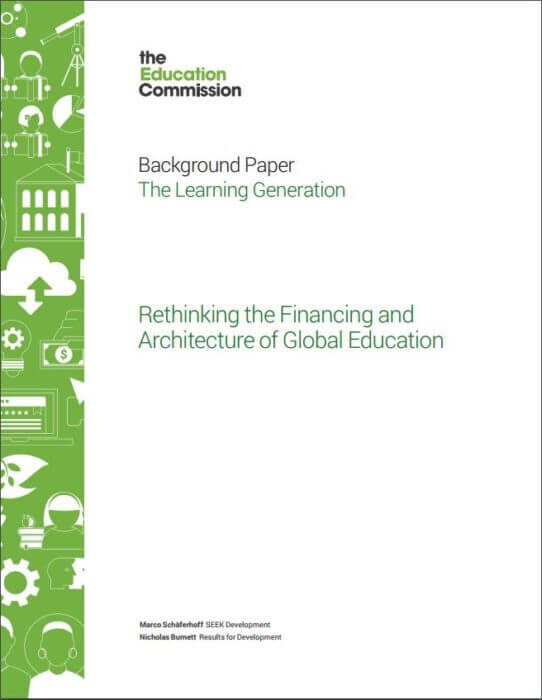 As research partners to the Education Commission, SEEK Development and Results for Development led an analysis of sources of domestic and international financing and the current global education architecture culminating in this report. Our analysis shows that domestic financing for education continues to grow but that the increase is largely driven by economic growth rather than by prioritization of education within government budgets. Furthermore, the quality of international aid financing is poor. Prioritization of education by bilateral donors fluctuates substantially between years and only a quarter of ODA is from multilaterals. Donor fragmentation is increasing, leading to high transaction costs for recipient countries. There are lost opportunities to use donor funding strategically to incentivize increased domestic funding. The Global Education Architecture has many opportunities to address its shortcomings and leverage its strengths. However, a number of key areas are particularly weak, including systemic leadership, and resource mobilization, both for specific institutions like GPE and for specific purposes such as the provision of global public goods. The system is threatened by its weak leadership, especially now as the ongoing refugee crisis results in shifting donor budgets, with already signs that education ODA is being reduced. Despite these challenges, there are several important opportunities, above all a growing global concern for education that could be leveraged to reform the education architecture.